The gist: We tend to think our biggest ideas are our best ones. It’s actually the opposite. Your best ideas will start tiny and have these three characteristics. I spend a lot of time concocting lists of random ideas to make life better. If I have a problem, I can immediately hatch a plan to fix it. Over the years, though, I’ve learned my “great ideas” cause more problems than they solve. In the heat of the moment—stress building—I’ll come up with a complex scheme, and go off to implement it, not realizing the added complexity will eventually cause even bigger problems. Consequently, I’ve learned it’s when I have the restraint to follow my tiniest, most simple ideas that I benefit most. The elegance of a tiny solution to a big problem is a thing of beauty. That’s why I love Southwest Airlines’s story of near failure turned massive success from the tiniest change. It’s a testament to the power of tiny ideas, and it illustrates the rules for identifying, committing to, and following through on your best ones. How do you nurture a tiny idea into a great success? Like this. March 29, 1971. It was a historic day for a new underdog in the world of aviation. Air Southwest changed it’s name to Southwest Airlines and started operating its first flights. But just getting started wasn’t the only hurdle to overcome. For the next year and a half, Southwest lost money. A lot of it. It got so bad one of their only four aircraft had to be sold to make payroll. Things weren’t looking good, but that’s when a man by the name of Bill Franklin stepped onto the scene. If you’ve ever planned a trip before, you know how much airlines love to complicate things. Hundreds of variables go into figuring out how much you pay for your seat and how comfortable you’ll be in the air. Southwest probably explored every one of those variables, but Bill Franklin’s tiny idea is the one they went with. It was the one that changed everything. The idea? Turn each plane around and get it back in the air in ten minutes or less. It’s famously called the 10-minute turn and it allowed them to operate more flights—and make more money—with fewer planes. A tiny idea, yes. But was it easy? No. Making Southwest’s 10-minute turn come to life took incredible planning and cooperation from everyone at the company. But it worked because everyone understood the goal and could pitch in. That’s the thing about great ideas. Even when they grow big they stay simple and focused. Not every little idea you have will be a winner, though. There are a few universal rules that will always apply to your best ones. If I had a dollar for every complex idea I’ve pondered… I’d be broke. Those ideas are so easy to come by, I’d waste all the money on junk I don’t need. A great idea is simple and stubborn. It comes back over and over and, each time, you find an excuse to put it off because it’s inconvenient. The ideas you value should be the ones you can’t forget, not the ones you can’t remember. There’s a simple test for this. When you fixate on an idea, ask yourself if you need to write it down so you don’t forget the details. If you do, it’s not a great idea. Or maybe there are just too many details. Try making it smaller and see if you still feel the same. 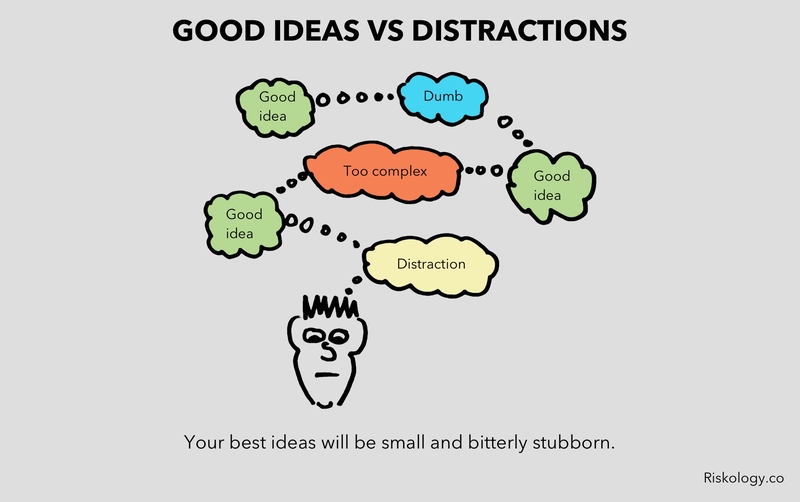 Of the dozens or hundreds of ideas that come and go daily, most will be distractions. The few that aren’t? They’ll be there tomorrow waiting, stubbornly, for you to act. 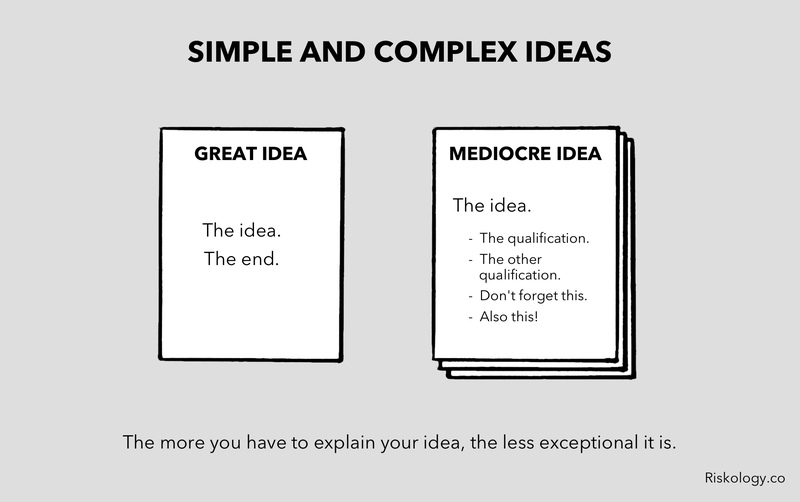 A great idea is a simple idea; you should be able to explain it in a sentence or two. I have a bad habit of creating complex ideas and over-complicating simple ones. It’s a function of self-doubt. Most simple ideas are already taken, so I worry they’ve already been done (and been done better). I think that if I complicate it or add variables, I can make it my own. Execution. That’s what belongs to you. Take the time you’d spend creating a complicated idea and spend it rocking a simple one instead. There’s a popular belief that anything worth doing is really hard. It’s only partially true. When you have a great idea, bringing it to life is actually easy. If that sounds wrong, think about some of the best ideas you’ve come up with yourself. Perhaps it was hard to get yourself to do the work because social pressure or lack of motivation dragged you down but, once you were doing it, you found it was a lot easier than you thought it would be. Similarly, think of Martin Luther King or Gandhi’s ideas to gain rights through civil disobedience. The act itself is incredibly simple. All you have to do is show up. There may be a number of things like fear or rejection or something else that make getting to the starting line difficult. But once you’re doing it, it’s easy. And the easiest way to get to the starting line of a great idea is to start small. Am I working on this because it seems like a good idea, or because I won’t get it out of my head until I do it? Is what I’m doing simple enough a child could understand? If this is hard now, can I see how it will become easier over time? Your answers to those questions will give you a strong indication if you’re really focused on your best, most important work or if you might be chasing a distraction. What we know for sure, though, is that your best ideas will start smaller than you think they should. Hat tip to Derek Sivers for his great explanation of how ideas are just a multiplier for strong execution.